You are currently browsing the tag archive for the ‘Zwingli’ tag. The previous post in this series on Christian liturgy looked at Martin Luther’s liturgy in German, which appeared in 1526. Those who missed the previous instalments on early Christian liturgy, that of the East, changes during the Dark Ages and Mass during the Middle Ages might find them helpful in understanding the services which emerged during the Reformation. Today’s entry examines Ulrich Zwingli’s rite for his churches in and around Zurich. 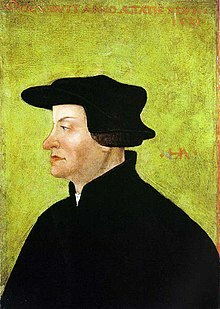 Before we go into Maxwell’s text, however, what follows are some facts about Zwingli, some of which demonstrate the influence he has had on Protestant churches to this day. Zwingli had the same vehement complaints against the Catholic Church as the other early Refomers: questioning aspects of the Mass, forbidding remembrance of the saints and criticising corrupt clergy. 1/ Was the first to use and develop lectio continua, which consisted of preaching on one book of the Bible at a time, disregarding the Church calendar. In 1519, during his early ministry, he began with Matthew’s Gospel — still pre-eminent at the time — then did the same with Acts, the Epistles and the Old Testament. This continuity provided the congregation with a greater understanding of the Bible. A number of independent churches do this today. My Forbidden Bible Verses series follows this format, too. 2/ Vehemently opposed Lenten fasting and food restrictions. On the first Sunday of Lent in 1522, he and a dozen followers cut up two smoked sausages and distributed the meat in Zurich. This is known as the Affair of the Sausages, considered to be the beginning of the Reformation in Switzerland. Zwingli also maintained that there was no scriptural support for food restriction of any kind at any time. 3/ He opposed celibacy on the part of clergy. In fact, he had secretly married widow Anna Reinhard in 1522, after the Affair of the Sausages. They were publicly married in 1524, three months before the birth of their first child. 4/Believed the Sacrament and the Liturgy of the Upper Room were symbolic of Christ’s body and blood and the Last Supper. He did not believe in the Real Presence, arguing that Christ gave His greatest sacrifice for us once and for all time. Therefore, it must not be re-enacted in a sacrificial or mystical way but in the manner of a memorial. 5/ Took issue with Anabaptists, radical reformers who did not believe in paedobaptism and did not hesitate to rebaptise people they felt had not received this sacrament properly as Catholics or Protestants. It was Zwingli and the Zurich City Council — not John Calvin — who condemned Felix Manz, the first Anabaptist martyr, to death by drowning. Now to Maxwell’s chapter on the Zwinglian rite, developed in 1525, at the same time Luther was devising his service in Germany. Because Zwingli held that the Sacrament was but a memorial, he said that his followers should be able to receive it only four times a year: Easter, Pentecost, one Sunday in the autumn and Christmas (p. 84). Although Luther and Calvin promoted weekly Communion, as their denominations and other Protestant churches evolved, people received Communion only a few times a year. A shortage of clergy accounted for this as did the requirement for communicants to meet with the celebrant the week before the Communion service. That said, even at four times a year, these Protestants probably received the Sacrament more frequently than Catholics; it was only in 1905 when Pius X encouraged Catholics to receive Communion at every Mass. Zwingli’s communicants sat together in church, and deacons brought the elements to them. The communicants remained seated during this time. The paten — plate for the bread — and cup were made out of wood to avoid any ostentation. Zwingli’s was the second liturgical rite to incorporate a public confession of sin. The first was Diebold Schwarz (Theobaldus Niger, in Latin) who modified the Confiteor for Protestants in Strasbourg in 1524, one year before Zwingli’s services began (p. 88). This came after the sermon (p. 84). Today, nearly every church — including the Catholic Church — has incorporated a public confession of sin into its liturgy. Although Zwingli’s rite of 1525 differed from Martin Luther’s, it was equally as pared down. Zwingli rearranged aspects of the Liturgy of the Word. It was a combination of Mattins and the Prone, a Catholic service without Communion, spoken largely in local language. The Prone was popular in Germany and France. – After the Offertory came the readings for that Sunday: the Epistle and the Gospel. In between the two, the congregation — men on one side, women on the other — recited the Gloria antiphonally. – Zwingli might have been the first Reformer to write a prayer of humble access — expressing man’s unworthiness and giving thanks for the Sacrament — which the celebrant said. The congregation also knelt for this prayer. – The service concluded with a psalm, a collect and a brief blessing. – Zwingli did not allow any music initially, although he relented a few decades later. – the separation of the Lord’s Supper from the Lord’s Day. Yet, albeit unintentionally, Zwinglian principles entered into other Protestant denominations to the point where present day Reformed pastors and elders wonder whether their congregations think of the Supper as a mere memorial, symbolic in content and nature. Not so long ago, most Reformed (Calvinist, including Presbyterian) churches had Communion — Supper — services once a month. Today, that tradition is changing, with more churches embracing a weekly Supper. Those churches which have not yet done so say that the frequency of the Supper might diminish its significance to the congregation. Along with this is the rationale that, during the service, congregants will choose to reflect on either the preaching or the Supper but not both. Others say that their church’s tradition has always been for a quarterly or monthly Communion service. All of these are reasonable. this is the one thing the Lord commanded we do to remember Him and what He did. If you don’t have the time, please feel free to cut out the collection of money, the silly dramas [some Reformed churches feature short plays during their services], the endless singing about how great God makes you feel (not Glory to God in most contemporary Christian music), the light show, the “howdy” (greeting…where everyone walks around talking about anything but Jesus). You can’t spare 10 minutes out of the weekly hour to remember what Jesus did for you? SHAME! However, there are deeply rooted historical reasons why Communion has been infrequent in Reformed churches. the Lord’s Table should have been spread at least once a week for the assembly of Christians, and the promises declared in it should feed us spiritually. However, he was unable to persuade the Geneva City Council of this principle. At this time in history, large European cities often legislated on matters spiritual as well as temporal. The Council approved monthly Communion. In Zurich, Ulrich Zwingli took the view that the Sacrament was but a mere memorial of the Last Supper and offered no means of grace. Appalled, Martin Luther took strong exception to this and told Zwingli that ‘another spirit’ moved through him. Nonetheless, Zwingli set a quarterly Communion observance for his followers: one Sunday in the autumn, followed by Christmas, Easter and Pentecost. John Knox promoted the Geneva pattern of Communion in his Order of Geneva (1556). Six years later, the First Book of Discipline adopted by the General Assembly of the Church of Scotland (1562) was issued. It called for a Zwinglian quarterly observance in Scottish cities and twice a year in countryside churches. By the 18th century, Presbyterians in Scotland received the Sacrament rarely. Many only received it annually for the following reasons: suspicion of clergymen, lack of ordained ministers and a shortage of bread because of widespread poverty. These annual commemorations of the Supper turned into what were called Communion Seasons. The faithful began by fasting on a Thursday, attending a church service on Saturday where they received their Communion tokens, receiving the Sacrament the following day and a thanksgiving service on Monday. If these remind us of revivals, that is indeed how they turned out. The same weekend format was adapted for American revivals, with a certain amount of religious enthusiasm. By the end of the 18th century, Presbyterians in the American colonies held opposing views with regard to the frequency of Communion. Whilst the 1787 Directory of Worship for American Presbyterianism stipulated the annual Communion Season, a Scottish-educated minister in New York City disagreed. In his 1797 book, Letters on Frequent Communion, John Mitchell Mason argued that the showmanship of the revivalist approach detracted from traditional Presbyterian piety. He advocated weekly Communion as a consistent means of grace. There was one issue with frequent Communion, not only in the Presbyterian Church, but also in the Reformed congregations. Those wishing to receive the Sacrament were required to attend preparatory classes at their church in the days before each Communion Sunday. Ministers and elders gave tokens to those whom they had deemed worthy. The recipients were then required to present the token at the service. These circumstances made frequent Communion services impractical. 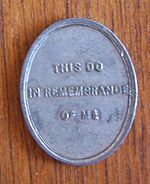 Although Communion tokens have long been history, Reformed clergy and congregations still struggle with the frequency of Communion services. Both of these things (the length of the form and the manner of celebration) support infrequent communion and, therefore, need to be adjusted before positive change can be made. Personally, as a former Catholic, now Anglican, I would agree that frequent reception of Communion, sadly, does become overly familiar and loses its significance. That is a terrible admission to make, however, it is true. I have also seen it in other Catholics during my time. When I first became an Episcopalian, my church had monthly Communion services. (That said, the 8:00 a.m. and 5:30 p.m. services were always for Holy Communion as were Wednesday evening services.) I felt better prepared spiritually for less frequent Communion. I could also concentrate more on the readings and sermons during Morning Prayer Sundays. My weakness, but no doubt others’, too. I spent quite a bit of time seeing how often Presbyterian churches have a Communion service. Here are but three examples in the PCA: one has it quarterly (the Supper elements have been prepared by the same family line for 150 years! ), another has it monthly and a third has one weekly. It will be interesting to see what the future brings in this regard. Is Osama bin Laden really dead? Did he die several days ago or had he been dead for some time, with the release of this news carefully co-ordinated to coincide with the release of President Obama’s supposed long form birth certificate? Who knows? These questions will keep the blogosphere alive for years to come. However, leftist Christian apologists are questioning the morality of the death of this ex-CIA operative who claimed responsibility for killing thousands of innocent people through spectacular terrorist attacks. Cranmer has analysed an article which appeared on the site of the Anglican-Anabaptist think tank, Ekklesia. Be of no doubt of the influence of this organisation. In true Christian humility, they describe themselves as ‘the UK’s premier religious think-tank’. A number of traditional British Christians — those who know of this marginal organisation, anyway — think it is more a group of leftist agitators cloaking themselves with a light fabric of Christianity. In any event, the Social Gospel and Anabaptist pacifism permeate their agenda. On to Osama bin Laden (‘Osama, son of Laden’, literally). Ekklesia asked one of their regular contributors, Michael Marten — a lecturer in Postcolonial Studies at the University of Stirling (Scotland) to give his opinion. My overseas readers should note that this institution is not among the foremost of higher institutions of learning. So, one would do well to take in what Mr Marten says but not be taken in by it. Is the self-confessed and widely recognised mastermind of the September 11th atrocity an exception? Ekklesia take the view that Bin Laden was an utterly insignificant figure and ‘not highly regarded by most Muslims’ because ‘his understanding of Islam (was) no less abhorrent than many Christians’ perspectives of Hitler’s understanding of Christianity’. One has to wonder how many Muslims Ekklesia know, and how they have arrived at ‘most’ in a world of more than a billion. Wearing their repugnant anti-Americanism on their sleeves, they refer to the ‘murder’ as a necessary ‘violent revenge for Americans’: they protest that Bin Laden’s influence was due to his ‘elevation to a position as “super-terrorist” by US Presidents Clinton, Bush (the Lesser) and Obama’. But that’s not all. The way many of us think about Bin Laden arises, they aver, ‘from a racist strand of thought’. Brilliant, isn’t it? They racially denigrate Americans and elevate Islam to the position of super-race, and then accuse us of racism and ignorance. And they sneer at the ‘paucity of intelligent reflection and comment’ of those who conflate Bin Laden’s thinking into ‘fundamentalist Islam’. But this is Ekklesia. They appear to be aware of the moral principle which forbids murder, but utterly ignorant of centuries of Scholastic moral theology and the principle of ‘Double Effect’ (the distinction between intention and foresight): the Christian may indeed act in such a way as will foreseeably produce an evil effect in order to secure some proportionate good or avoid some proportionate evil. The principle does not convey a formal moral truth about murder: it arose largely out of attempts to understand the morally significant differences between murder and other kinds of killing. But it does grasp the fundamental distinction between foresight and intention. One cannot help but wonder if Ekklesia would be happier embracing Islam in one of its 57 states. Their leftist, communitarian, binary outlook dovetails nicely. This is a good illustration of the confluence of leftism in all its strands and Islam. Both seek to change Western society dramatically. So, one works hand-in-glove, directly or indirectly, with the other. Labour and other left-wing political parties accommodate Islam. Ekklesia does so from a notionally Christian perspective. Left-wing Anglicans also contribute; the Archbishop of Canterbury is preparing the faithful for Sharia law, which he said in 2008 was ‘inevitable’. Similarly, many British Muslims find left-wing politics, ‘Yes to AV’ and communitarianism compatible with their thinking. Whatever ‘mixes it up’ socially and politically helps. The same process is going on in other Western European countries, namely France, Belgium and the Netherlands. As for the Ekklesia brand of Christianity, historically, the Anabaptists have borne a grudge against not only the Church of England but also other churches of the Reformation. Zurich was a hotbed of conflict between Zwingli, his fellow reformers and the Anabaptists. The City Council condemned the Anabaptist Felix Manz to death by drowning in 1527. This is the death which today’s Anabaptists mistakenly attribute to Calvin and the City Council of Geneva. So, we have a long history of sectarian Christians in conflict with the established Church. (The Quakers and the Amish are also associated with this counter-cultural conflict but are quieter about it these days, with the latter having a degree of cachet about it.) It’s alive and well today, perhaps best expressed in the UK through Ekklesia (despite the supposed Anglicanism of some of its members, like Mr Bartley). Not all ‘Christian’ opinion writers are what they purport to represent.